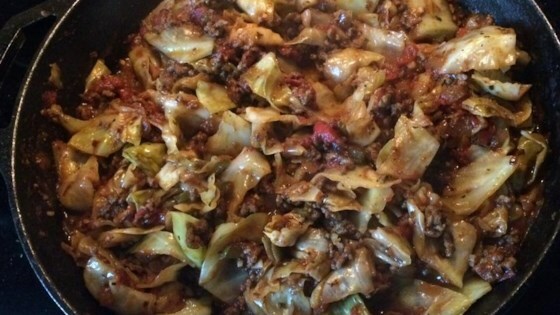 "This is an alteration on a typical stuffed cabbage recipe. It's healthy, low-fat, low-carb, and a bit spicy. You can't go wrong with this recipe! You may omit the red pepper and cayenne if you do not like spicy foods, or increase like we do! We serve this over brown rice to make it more of a whole meal. We love it! I used roasted garlic-flavored tomato sauce for extra 'kick.'" Heat a large skillet over medium-high heat. Cook and stir ground turkey in the hot skillet until browned and crumbly, 5 to 7 minutes; drain and discard grease. Transfer cooked turkey to a bowl. Heat olive oil in the skillet over medium heat; saute onion in hot oil until translucent, about 5 minutes. Add garlic to onion; saute until fragrant, about 1 minute. Pour diced tomatoes and tomato sauce over the onion mixture; season with Italian seasoning, basil, red pepper flakes, cayenne pepper, salt, and black pepper. Reduce heat to medium-low and simmer tomato mixture until the tomatoes are softened, about 10 minutes. Stir cabbage into the tomato mixture; continue cooking until cabbage is tender, 20 to 25 minutes. Stir ground turkey into the mixture; cook to reheat the turkey, 1 to 2 minutes. Working on making this right now. I can barely fit it in the skillet. I hope it turns out. There doesnt seem to be enough liquid to cook the cabbage. Too spicy, not one of our favorites.